I left off last time talking about how God tells Moses his personal name, Yahweh (of course this is a transliteration and we do not know how it would have been pronounced, because the original pronunciation has been lost. That’s for another post.) 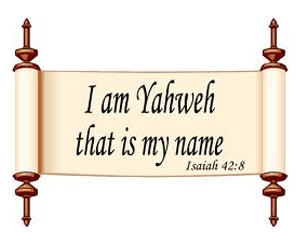 When translated Yahweh means “I WAS, I AM, I WILL BE” the shortened form being “I AM”. It encompasses everything about who God is; he is the self existent one, without beginning or end. I can almost see Moses, in confusion with more questions than answers! “I AM” what? And we can truly contemplate that for an eternity!!! But it’s almost as if God left a big ol’ fat blank, to be filled in later. I love that God continually reveals new things when we are ready for them. Let’s look at a few interesting facts about God’s name, Yahweh, before we go back to John. 1. Yahweh (YHWH) occurs more than 6,800 times in the Old Testament! Safe to say he wants us to know his name! 2. It is the name of God that is most closely related to his redeeming acts in Israel’s history. 3. God describes himself as: compassionate; gracious; slow to anger; abounding in love and faithfulness; maintaining love to thousands; forgiving wickedness, rebellion, and sin; a punish-er of the guilty. 5. The name Jesus, the Greek form of Joshua (Yehosua), literally means “Yahweh saves” or “I AM saves”! The Greek word translated “revealed you” can also be translated “revealed your name”. I believe a great deal of what Jesus is speaking of here is revealed in the “I AM” statements throughout John. In a very real sense Jesus revealed the I AM, or Yahweh to us by the things he said and did. He filled in that big ol’ fat blank that God left when he spoke with Moses about his name! And Amen that he did!! !